Your browser doesn't support video. Download to watch it in another app. Exify is a collection of tools for people who take their iPhone photography seriously. These tools can be accessed from a standalone app or action extensions that work in Photos, Messages, Safari and many other apps. 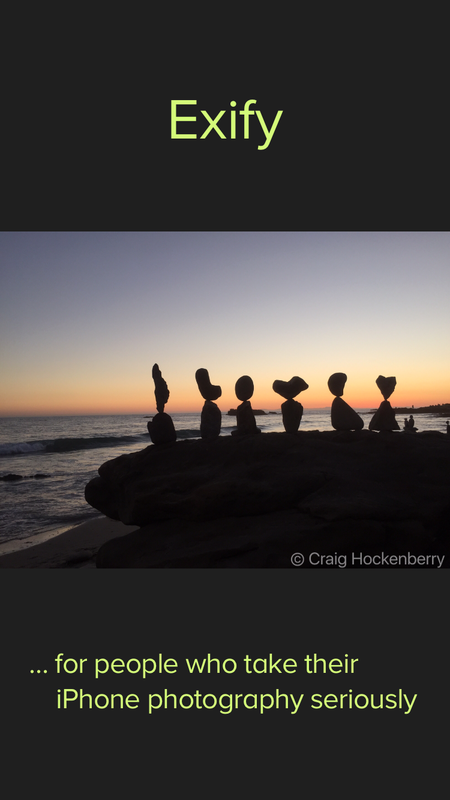 An editing extension is provided to add watermarks or metadata like copyright from within the Camera or Photos app. Take a quick tour in the video to the right, check out the features below, and then download a copy from the App Store. Every photographer needs a copy of Exify in their pocket! The overview shows the most important things about your photo. Information about the file is shown first: format, dimensions, aspect ratio and color space. 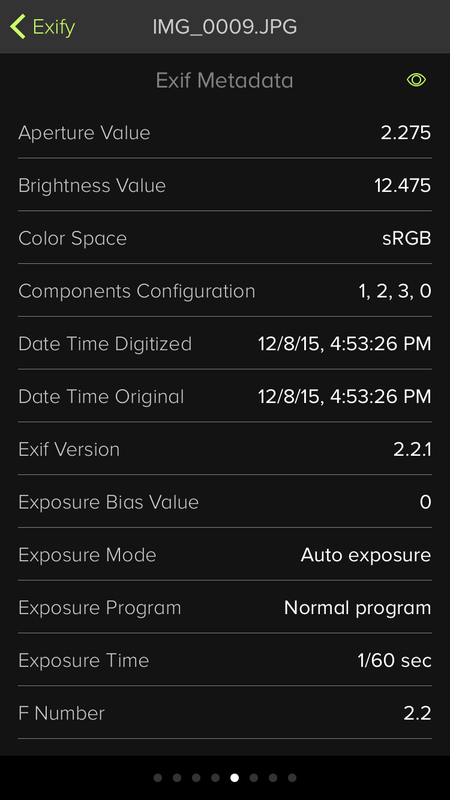 This is followed by the lens, film speed and exposure time for the photo. The preview includes a circular symbol showing the iPhone's camera position and orientation. The auto-focus area is shown as a yellow box. The round magnifier lets you examine details in your image at 1×, 2×, and 4×. There is no smoothing in this view: you're seeing pixel-level detail. Double tap on the magnifier to change the zoom. The image behind the magnifier can be adjusted by pinching: the scale factor snaps to standard values like 25%, 50%, etc. You can also hide or show the magnifier using tap and hold. Each view in Exify has an inspector (eye) icon in the upper-right corner. Tapping this icon gives you more information and allows interaction. In the overview, the inspector lets you do two things: sample colors and measure proportions. Tapping anywhere in the image moves the color sampler. You can also fine tune the placement by dragging up and down on the preview. The color values are displayed both in standard RGB format and a grayscale luminosity value. The proportions are shown while you're dragging on the image. The histogram shows a distribution of color in the image, either as individual RGB channels or grayscale luminosity. The graph is divided into three sections from left-to-right: shadows, midtones, and highlights. A yellow line shows the median luminosity. When this value falls in the midtones, it's a good indication of well balanced tonal values. 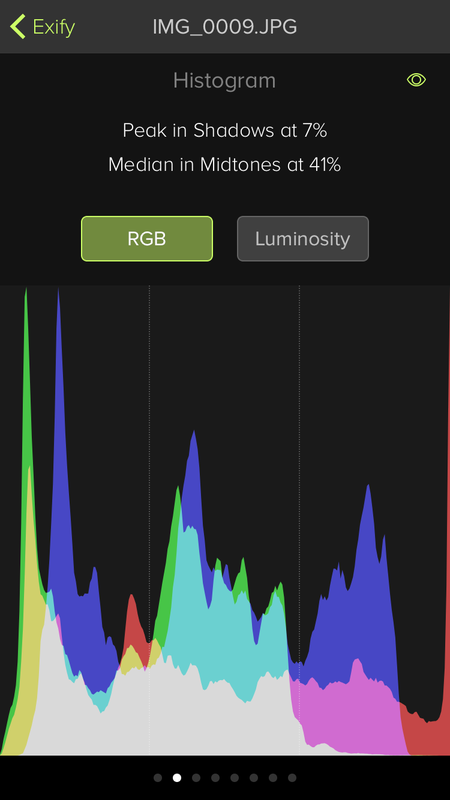 After turning on the inspector (eye), you can measure the histogram distribution. If a photo contains GPS information, a map with the location will be shown. The red pin indicates where you were standing and the map is oriented using the lens direction. The satellite view can be useful if you were in a remote area without roads or other features. Double tapping with one or two fingers can be used to zoom the map. The date and time of the photo is also displayed along with the coordinates and bearing. When available, the elevation is also displayed. When the inspector is turned on, you can interact with the map using pinch to zoom and rotate. The marker icon resets the position. 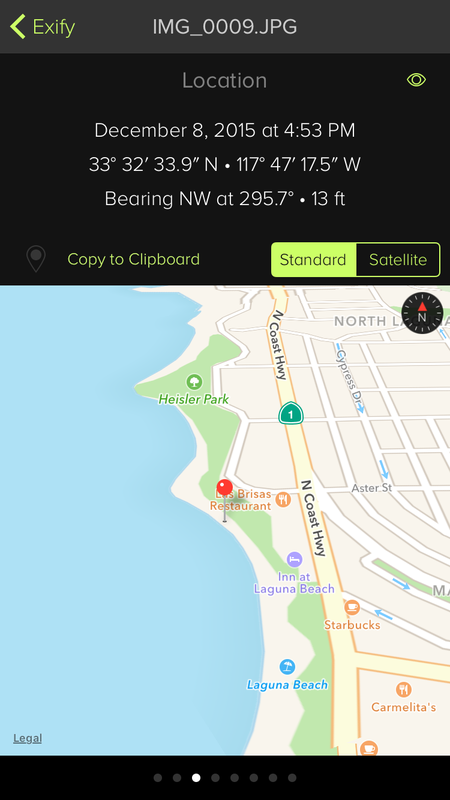 If you need to use the location in Maps or another app, use the Copy to Clipboard button to transfer the coordinates. Every photo you take includes a lot of metadata. 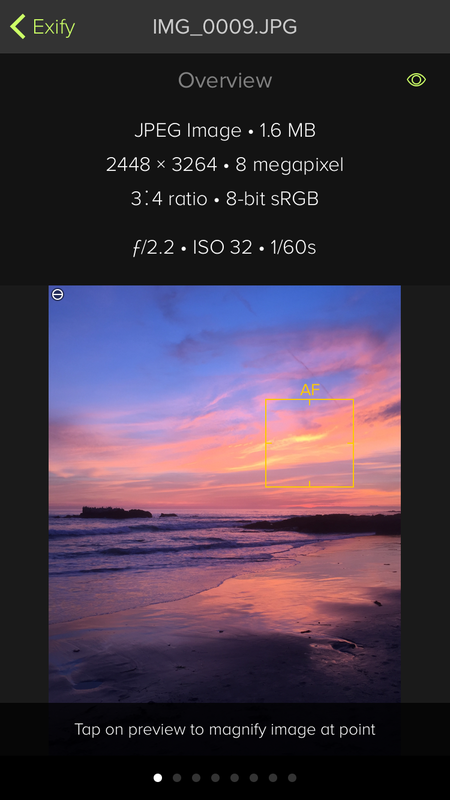 If you want to know if the flash fired, the model of iPhone used, if the image has a copyright, or anything else about the photo, just refer to Exify's lists of metadata. The type of metadata being displayed is shown in the header. The values are displayed according to the Exif and TIFF standards. If you want to see the raw numeric values, enable the inspector. At the bottom of each list is a button to copy the information to the clipboard. This JSON data can be used in another app or with the editing extension shown below. 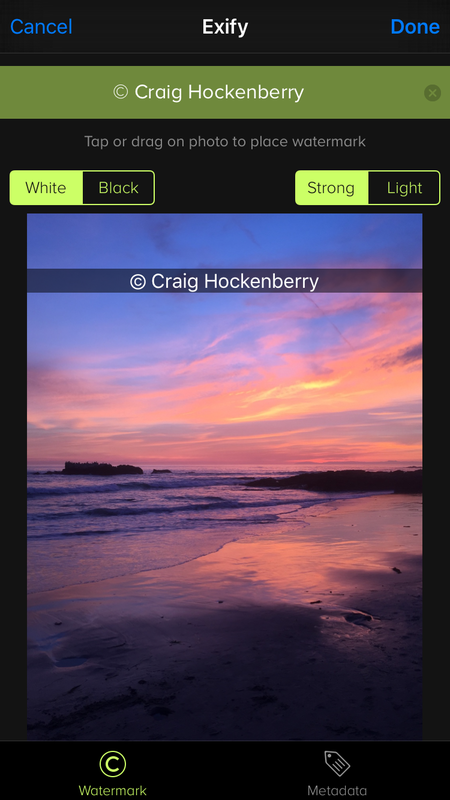 Exify can be used as a standalone app that shows images in your Camera Roll or from an action extension in other apps. 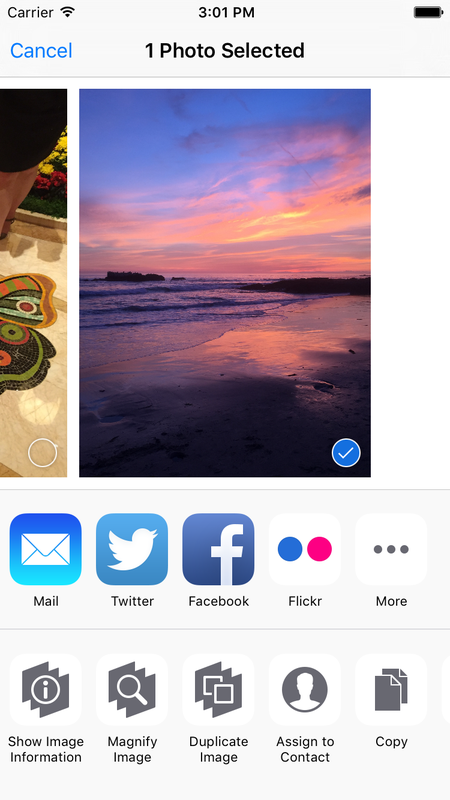 Many apps, including Photos, Messages, and Safari, have a share icon (the box with the arrow pointing upwards). When you see this icon for an image, you can use Exify. The Show Image Information and Magnify Image extensions do the same things you saw above. 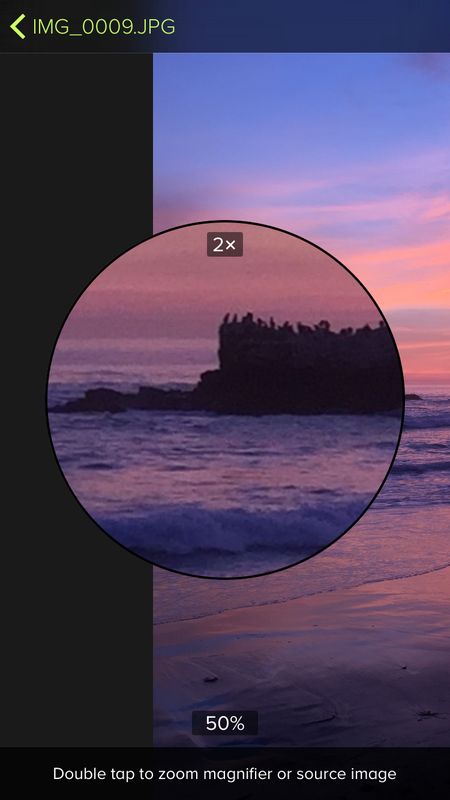 You can use the Duplicate Image button to create a copy of an image in your Camera Roll. This can be handy if you want to save the original before editing: some photo apps remove Exif metadata or don't allow you to undo changes. A photo editing extension is also included. This tool lets you add two things to your photo: a watermark and textual metadata. This short tutorial explains how it works. There are several options for the watermark that let you tailor it to your needs. The text you enter is recorded so it's quick and easy to add the same watermark every time. When you tap Done, the image is updated. If you want to remove the watermark, use the Revert feature in the Photos app. When an image contains location metadata, the editor can be used to remove the information for privacy. Copyright © 2018 The Iconfactory, Inc.